Ecotourism is one of the important components of Iwokrama’s strategy for financial self sufficiency. Your visit to Iwokrama directly contributes to the communities in and surrounding the Iwokrama forest. Tourism here supports the development of an eco-friendly sustainable model which is being shared locally, nationally and internationally. Updated 10-May 2018. Subject to change without notice. Accommodation is provided in eight (8) well-appointed cabins with en-suite bathrooms and stunning views of the Essequibo River; a research building with six (6) bedrooms and shared washroom facilities; a training building with four (4) rooms containing multiple bunk beds and an auditorium; and full serviced camping facility downriver at the base of Turtle Mountain. All prices are quoted $USD and includes are taxes and service charges. Prices shown do not include a mandatory $USD 15 Iwokrama Forest Conservation User Fee. Payment of this Conservation Fee covers your entire visit to the Iwokrama forest and funds community development projects. Payment may be made in $USD, $GYD, Visa, MasterCard, American Express, or travellers cheques. Internet access at the Lodge is subject to technological and meteorological constraints and is not guaranteed. Prices subject to change without notice. Please use the chat facility on this page or contact us to discuss your preferred travel dates and arrangements and to confirm availability and pricing. All prices are quoted $USD. Group rates may apply. Prices shown do not include a mandatory $USD 15 Iwokrama Forest Conservation User Fee. 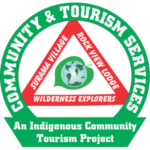 Payment of this fee covers your entire visit to the Iwokrama forest and funds community development projects. Payment may be made in $USD, $GYD, Visa, MasterCard, American Express, or travellers cheques. Prices subject to change without notice. Please use the chat facility on this page or contact us to discuss your preferred travel dates and arrangements and to confirm availability and pricing. All prices are quoted $USD. Prices shown do not include a mandatory $USD 15 Iwokrama Forest Conservation User Fee. 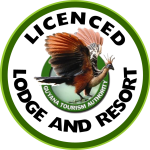 Payment of this fee covers your entire visit to the Iwokrama forest and funds community development projects. Payment may be made in $USD, $GYD, or via Visa, MasterCard, American Express, or travellers cheques. Prices subject to change without notice. Please use the chat facility on this page or contact us to discuss your preferred travel dates and arrangements and to confirm availability and pricing. 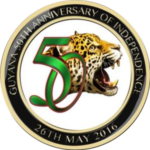 For local residents & CARICOM citizens – Guyanese nationals, persons residing in Guyana and citizens from CARICOM countries will get 20% off on accommodation, meals and tours all year round. For non-CARICOM citizens (all other countries) – Persons from all other countries are entitled to a 30% discount on accommodation only during the rainy season period of May 1st – July 31st. 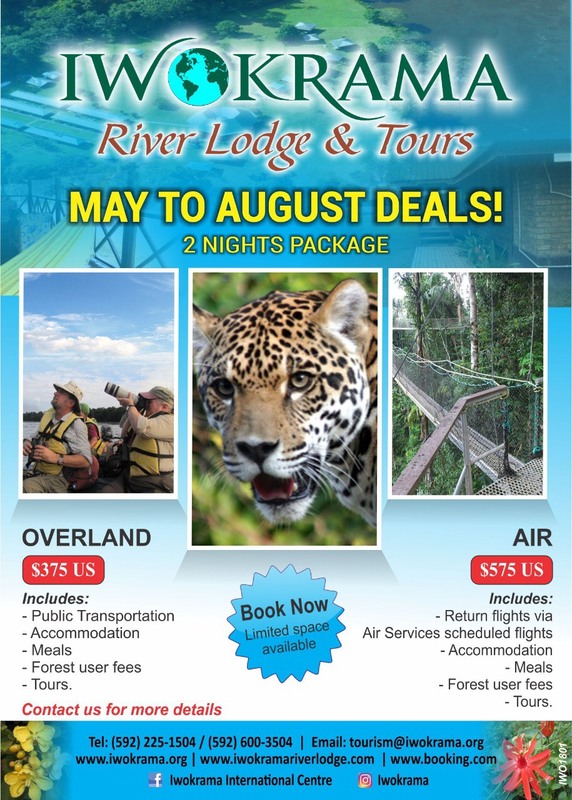 We accept payment at our Georgetown office for all services, tours, and visits at the Iwokrama River Lodge. You may pay with cash or credit card. Credit card payments will incur a 4.2% surcharge to cover unavoidable bank fees. In limited circumstances we are able to accept cash payments at the lodge, however there are no facilities to accept credit card payments at the lodge. We can accept payment for your tours and other services via international wire transfer using the details below. You must add a $35 Wire Payment Fee to the invoice amount when remitting funds (e.g. if you were invoiced US$500, then you should execute a wire transfer of US$535). You are responsible for all transaction and intermediate fees charged by your bank to execute the transfer. We quote all prices in US Dollars; the transfer should be executed in US Dollars so the amount received is exactly the same as the amount invoiced regardless of foreign exchange complications. Any discrepancy between the invoiced and received amounts will be due and payable before your tour can begin. 36-40, Water Street, Georgetown, Guyana, South America. Should any reservation or payment provision not be observed by the reserving party, Iwokrama River Lodge will be entitled to cancel the respective reservation with immediate effect. This will be done by way of written notice. Guest cancellation fees are calculated on the rate per person and on the total value of the full stay. All reservation amendments or cancellations are valid only if advised and accepted in writing, facsimile or e-mail. Iwokrama River Lodge strongly recommends that guests consider a travel insurance policy, which may assist in offsetting any unforeseen cancellation charges. All requests for provisional or confirmed reservations are to be made by the Guest by way of e-mail, letter, facsimile, voucher or addressed to Iwokrama River Lodge. No reservation will be deemed confirmed unless acknowledged and accepted in writing by Iwokrama River Lodge. The Lodge will respond to all reservation applications in a timely manner and will reply using the same medium of communication whereby the request was made. Provisional reservations will be held for 7 days, if a deposit is not made to confirm the reservation, the booking will be automatically released. • Guest’s last name and full first names. • Number and category of rooms required. • Preferred arrival and departure dates. • Arrival and departure points and information (airline, charter or transfer information). • Types of paid tours they would like to undertake. A non-refundable 20% deposit upon acceptance of reservations is to be received by Iwokrama River Lodge from the Guest within seven (7) working days from date of request; failure to provide a deposit will result in the automatic cancellation of the reservation. The balance is due not less than thirty (30) days prior to arrival. For reservations made within 14 days prior to arrival, the full amount of the trip is required. In the event you are unable to come due to extraordinary circumstances, we may transfer your booking to another party provided the arrangements remain the same. All prices are quoted in US Dollars, but we accept the local currency. 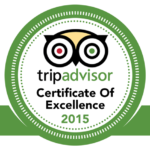 We accept Visa, MasterCard, and American Express as well as travellers cheques. Mode of transport utilised will be dependent on the number of clients travelling and participating in activities. All of our vehicles are 4 wheel drive and air conditioned. Fully trained and experienced English speaking driver/guides are provided. Large groups may have to share accommodation with a maximum of three adults per cabin. 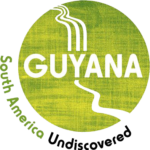 You are advised to buy travel insurance through your agent before coming to Guyana. Iwokrama reserves the right to employ subcontractors to carry out all or part of the transport agreed to be supplied. The respective laws of the country govern Iwokrama’s liability to passengers carried in its own vehicles. All claims are subject to the jurisdiction of the courts of the country in which the cause of action arises. When it comes to wildlife viewing, please be advised there are no guarantees. It is a privilege to see animals in their natural habitats; our experienced guides will take every measure to ensure your experience is enjoyable. The only thing you can kill is time the only thing you can take is a photograph; the only thing you can leave is your footprints. Wildlife viewing is also dependent on the seasons.